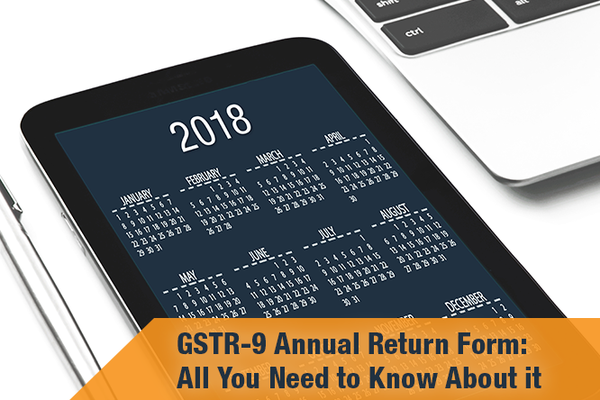 GSTR-9 is an annual return form that needs to be filed once a year by registered taxpayers under GST disclosing a detailed summary of outward supply and taxes paid thereon, input tax credits claimed, taxes paid and refund claimed in the financial year in respect of which such annual return is filed. Who is liable to file GSTR-9? Registered Regular taxpayers under GST who file GSTR-1 and GSTR-3 are liable to file GSTR-9. What does GSTR-9 Return form consists of? Part 1:It covers the basic details such as financial year, GSTIN, legal name, and trade name (if any). Part 2: In this section, you need to provide consolidated details of all your outward supplies and advances received on which tax is applicable during the financial year for which the return is filed. You also need to fill details of outward supplies on which tax is not applicable as mentioned in the returns filed during the respective financial year. 1st Sub-Section: In the first sub-section, you have to mention the details of ITC availed as declared in returns filed during the financial year. The mentioned details can be obtained from FORM GSTR-3B. 2nd Sub-Section: In the second sub-section, you have to provide details of ITC reversed and ineligible ITC as declared in return filed during the financial year. 3rd Sub-Section: The third sub-section asks for details of other ITC details, which is auto-populated. Part 4:It covers details of actual tax paid during the financial year. Part 5:You have to disclose details of amendments made i.e. additions or deductions made for the supplies of the previous financial year in the returns of April to September of the current financial year or the date of filing of an annual return for the previous financial year, whichever is earlier. Part 6:In this part, you have to provide information of any refund, demand, supplies received from composition taxpayer, deemed supply and good send of approval basis, HSN wise summary of outward and inward supplies and if any late fee payable or paid. What is the Penalty for Non-Filing of GSTR-9? As per Section 47(2) of Central Goods and Service Tax Act (2017), a person will be fined a penalty of INR 100 per day (CGST) + INR 100 per day (SGST), amounting to a total of INR 200 per day if he/she fails to file GSTR-9 before the due date. However, the maximum amount of penalty a person can be fined is 0.25% of the total turnover. When is the due date for filing GSTR-9? The due date for filing GSTR-9 is 31st December of the subsequent financial year. For example, the due date for filing GSTR-9 for the financial year 2017-2018 is 31st December 2018. The due date for filing GSTR 9, GSTR 9A and GSTR 9C has been extended upto June 30, 2019 in the 31st GST Council Meeting held on December 22, 2018. There were certain other changes also announced in the meeting regarding GSTR 9, please read here for details. GSTR 9 is quite an elaborate return and consolidates all the details and transactions of the financial year. As businesses have been filing monthly and quarterly GST returns, some of the sections of GSTR 9 hence can be directly derived from the previously filed GST returns. The implementation of GSTR 9 in GST system is in progress and once available for taxpayers and GSPs. Stay tuned with us for updates on GSTR 9. Nil GSTR9 Return Filing: Do You Need to Do That? This is a wonderful read. Thank you.